Of the 75 orphans housed at the Armenian Evangelical Boarding School (AEBS), only 2 have been sponsored. Will you help us change that? To sponsor one child for a year, we need to raise $600. That's just $50 to sponsor a child for an entire month, or $11 for a week. Our campaign goal reflects our hope to sponsor four orphans. The orphans of AEBS - in Anjar, Lebanon - find solace there from families who are deceased, unable, or worse, unwilling to support them. Although their enrollment costs are largely unpaid, AEBS does not turn them away. They are, however, in serious need of funding to pay for tuition, supplies, and medical/personal needs. Sponsorships help cover these costs. Silvana has never received proper care and emotional support from her parents. Her situation worsened when her mother passed away. She was left under the care of her incompetent father, who was unable to afford housing and provide for her. Silvana likes swimming, dancing, and chemistry. She wants to become a choreographer. Harout was born without an esophagus. His father is deceased and his mother is unemployed. He suffers from persistent bronchitis, allergies, and a weak immune system. He loves piano, dancing, and wants to become a medical doctor. Due to political tensions and his Syrian nationality, Desil’s father had to abandon his family and flee the country. Desil's mother is unable to provide for her because of her poor financial situation. Desil suffers from learning problems, and is in need of special tutoring. She hopes to become an architect someday. Sako’s father is deceased and his mother is a housekeeper who is unable to care for him. He loves singing and wants to be a singer when he grows up. If you are unable to donate, please help our cause by spreading the word and sharing this page. While funds do not substitute the role of a stable family and home in a child’s life, they allow these children to get the best care they can in the hands of the wonderful people at the AEBS. By investing in these children, we are communicating that they are worthy of a nurturing and bountiful environment – an immeasurably important message for orphans, and for us at the Society of Orphaned Armenian Relief. Thank you for your concern in making a difference in the lives of the children at the Armenian Evangelical Boarding School! Operation AEBS Sponsorship has been a huge success! We have reached our total campaign goal and will now be able to sponsor a FOURTH child! We are elated and deeply grateful about the success and support that this campaign has had. Thank you to everyone who has donated, spread the word, and kept up with our progress. Stay tuned for an update on the fourth child to receive a sponsorship! The checks have been written, our sponsorships are on their way! 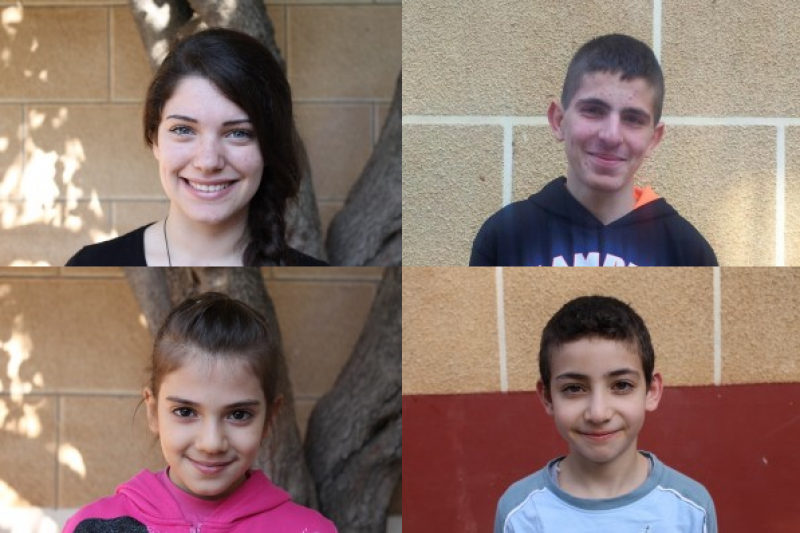 The children that will be receiving the annual sponsorships are Silvana Manougian, Harout Kaji, and Sako Demirjian. We didn't have to make the tough choice of picking three out of the four children highlighted in this campaign, because Desil (pictured bottom left) was no longer available for sponsorship. Thank you so much for helping out everyone. We will be requesting updates on Harout, Sako, and Silvana throughout the year. Please follow us on Facebook to stay in touch! Thanks to your help, we now have enough to sponsor three children for an entire year. We even have an additional $20 that will later go toward completing our 2016 goal of sponsoring a fourth child as well! I usually don't like when people say Happy Monday, but today it feels quite fitting. Our community effort has taken our reach across the world - from Seattle to Ainjar, Lebanon - to impact the lives of three children. Thank you to all of you who have made this possible! Hi everyone! We are so excited about the progress our campaign has made so far - we will be able to provide one annual sponsorship, and are $160 away from providing a second one too! In addition to the $320 we've received on GoFundMe, we have also raised $720 in cash. This is why our campaign goal has decreased from $2,400 to $1,680. Thank you so much for your contributions everyone. Every share and every donation is greatly appreciated and makes a world of a difference!